There is no knowledge without sharing. Empowering collaboration. Teaching is an impossible job. You will fail. Last weekend we were fortunate to attend a conference that our school hosted. The keynote speakers were Dylan Wiliam, Ron Ritchhart and Judy Willis. Dylan put everyone’s inner fears to rest when he declared that teaching was an impossible job. Have you ever felt that you have failed as a teacher? Well, you have. And you are not alone. It is impossible to meet everyone’s needs all of the time. Sometimes we may even meet no one’s needs! However, if we keep learning, trying and growing as teachers, we are doing the best anyone can do. Through our reading, our discussions and our professional development we are creating cultures of thinking amongst ourselves. The moment a teacher stops seeking a better way, stops listening, stops learning, and starts to blame her students for not understanding, she should quit. 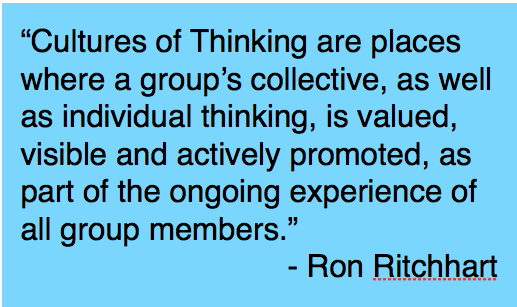 Ron Ritchhart gave us a tool to use to assess our classrooms – do we have a classroom that promotes a culture of thinking? Are we creating a climate where are students feel comfortable to fail, yet to keep on learning? 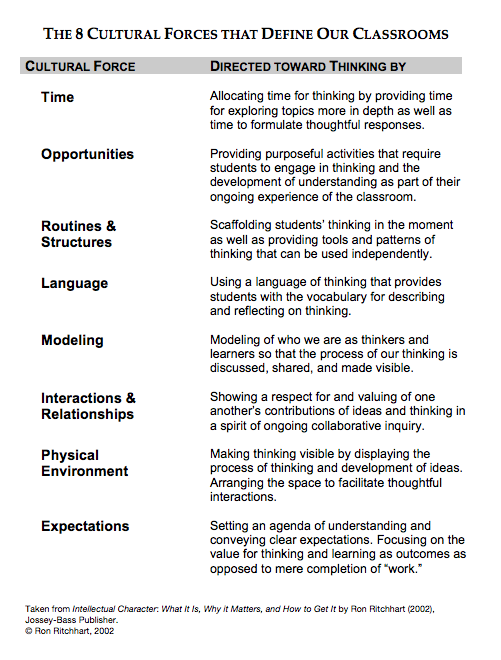 Students model the language and the culture of thinking of the teacher. Ask your colleague to listen into the discussions the students are having with each other. do they add to and use their environment to display and develop their thinking and learning? Not every lesson we teach will be awe inspiring. Yet, it is easy to assess a classroom’s culture of thinking and learning by looking around the room, listening to and watching the students interact. They are mirroring you. What is the culture in your classroom?